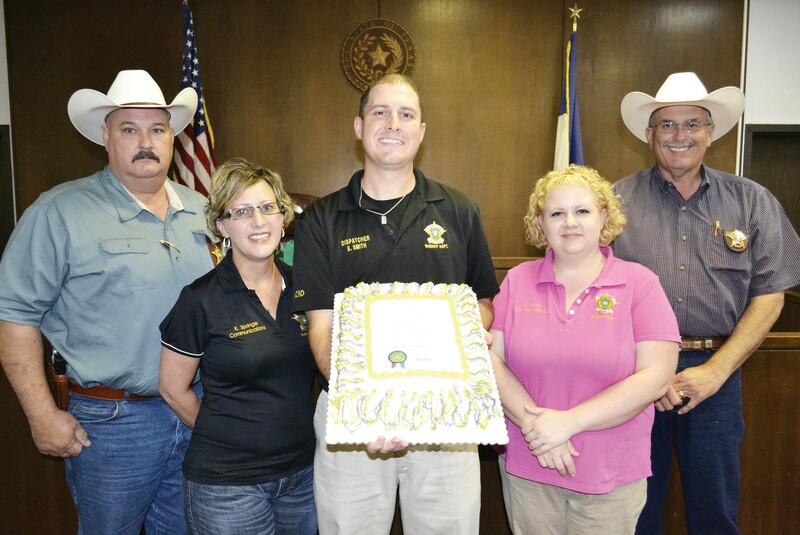 Last week was Public Safety Telecommunicator week and Atascosa County Sheriff’s dispatchers were honored by Sheriff David Soward and staff who presented them with a specially decorated cake sent by Texas Governor Rick Perry. The cake had the Governor’s proclamation declaring April 15th through the 19th as Public Safety Telecommunicators Week in Texas. Law Enforcement dispatchers and 9-1-1 operators are honored every year for their important role in public safety. Atascosa County Sheriff’s dispatchers and 9-1-1 operators are Sergeant Leonard Lozano, Elaine Pacheco, Candace Jones, Eric Smith, Andrew Guerra, Krista Springer, Beth Nadeau, and Dzenisej Georgiev. From left are: Chief Deputy Cregg Thompson, Dispatchers Krista Springer, Eric Smith, Candace Jones and Sheriff David Soward.